Obama visit brought mixed reactions to kenyans.Others were happy that the once powerful man of the soil come back to the country Just a year after being out of power while others questioned why he did not bring his wife together with him. So why did Obama not come with his wife Michelle Obama? Michelle Obama and Ms.Tina were dancing at Beyoncé & JAY-Z's show in Paris the day Obama came to kenya. 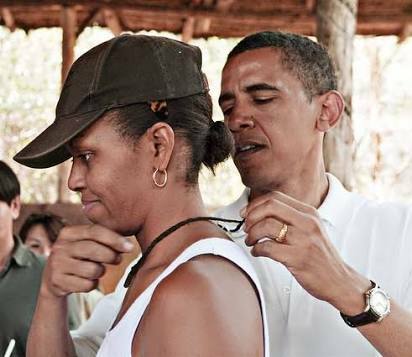 Michelle and Barrack Obama were in Tanzania for 8 days .Michelle Obama did not accompany the husband to his ancestral land - Kogelo. Opted to attend Beyoncé & JAY-Z's show in France last night. Michelle Obama opted to attend the event all by herself as her husband came back to her ancestral land. Thats the main reason and it had angered kenyans with some kenyans asking Obama to marry a second kenyan wife.